In 1908, Jack Norworth wrote the lyrics to “Take Me Out to the Ball Game” while riding a subway in NYC. It is unlikely that he realized at the time it would become a sports anthem for the ages. And surely he couldn’t have imagined that teachers should be singing the song with their students during the seventh-inning stretch of a baseball game. But it turns out that the Old Ball Game is of the best places to teach math to students. And the beauty of using baseball as a stand-in for math class is twofold. First, the principles involved can be taught at any level. You don’t need tickets to a Major League game to share geometric shapes with young learners, or explain decimals to older students. These concepts can be taught while watching a minor league game, or attending a contest at the local high school. And second, students will love attending a live baseball game. This change in venue will certainly break up what for many children can be the monotony of math class. Point – As a specific location in space, a point can be any particular object. An easy example would be a player in the outfield. But students could just as easily pick out a person in the crowd, or even a hot dog they are eating. Line – A line has only length, not width. It continues infinitely in either direction. A line segment is the part of a line contained between two specific endpoints. Students will be able to pick out a lot of lines at a baseball game. One line segment would be the third base line from home plate to the outfield fence. That line also continues in both directions beyond the baseball park. Parallel Lines – These are lines in the same plane that don’t intersect. Good examples in baseball are the pinstripes that many teams use in their uniforms. And in some ballparks, the well-mown grass shows the distinct pattern of parallel lines. Perpendicular Lines – These lines intersect at a 90-degree angle. The lines that meet at first base are perpendicular. Angle – This shape is formed when two lines diverge from a common endpoint. A good example would be the right angles formed by the perpendicular lines in the first-base answer above. Plane – The baseball field itself makes a good plane, which is a flat surface without thickness that continues infinitely in all directions. Circle – This set of points on a plane are all the same distance from the center. The on-deck circle is found at any ballpark, and in some stadiums you can find circles in the outfield that display the retired numbers of famous players. Triangle – This three-sided figure can be seen when imagining the lines between any two outfielders and one infield player. Square – This quadrilateral with four exact sides and four right angles can be found in many places, but the bases themselves are the most identifiable. Rectangle – These quadrilaterals with four right angles show up as any number of advertising banners in the outfield, but the scoreboard is the most recognizable rectangle around. Pentagon – Home plate is the easiest example of this five-sided polygon. See what other pentagons your students can discover. Hexagon – If you arrive before the game, you may see the pitching screen being used during batting practice. This is a common six-sided polygon in baseball. But what others can your students find? Octagon – Stop signs are the common example of this eight-sided polygon. But your students are unlikely to see these signs at a baseball game. Remind them that an octagon doesn’t only look like an eight-sided circle. Sometimes, teams create an octagon when they draw up the lines for the batter’s box. Challenge students to work hard to find other octagons. 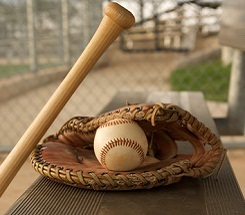 Sphere – The baseball itself is the best example of this three-dimensional shape. Cone – These three-dimensional objects have one vertex, and also a circular base. There may be orange construction cones that mark off a specific section of the field. Or students can eat their way through this shape by ordering a sugar cone with some ice cream between innings. Cylinder – The foul poles at either side of the outfield are thin examples of this three-dimensional figure, which features two parallel circular bases and a curved surface connecting them. See what other shapes your students can find. They might surprise you! Want a hit with the older students? Then you need to provide them a greater challenge, one that keeps them busy throughout an entire game. In this activity, you will test their concentration and calculator work by asking them to track the batting average for all of the players during that day’s game. Let them know right away that you will also be keeping score, and will compare their final answers to yours. Have students bring a calculator with them to the game. During the game, students should tally the number of hits each player gets compared to his plate appearances. At the end of the game, they will input that information into the formula below to determine the batting average for each player during that particular game. The closer the average is to 1, the better the player hits. Therefore, the formula above is a measurement of how well the player hits. Let students know that a batting average of .300 or better is considered excellent. And remind them to add a zero to the total they calculate to get the average to three decimal points. Here are the averages possible during a game with four and five at-bats (trips to the plate) respectively. Student: Why do we need to know math in real life?